Do you feel stiff in your hips when you ride? 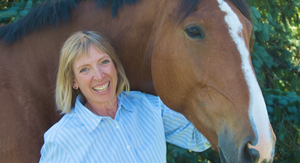 Do you feel like you are inflexible in the saddle? 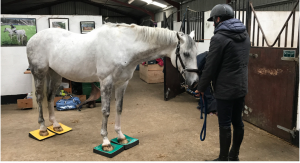 Do you have trouble sitting the trot? Perhaps the problem isn’t physical stiffness but lack of clarity. Photo 1. 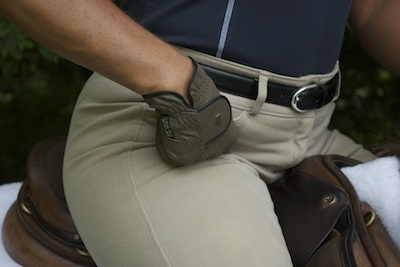 Place your index finger in the crease of your breeches to locate the front of your hip joint. Notice where the rider is pointing, this is the correct location, which is much further inward than most people think. Next time you ride notice what happens to your hips. Do you bounce at the canter? 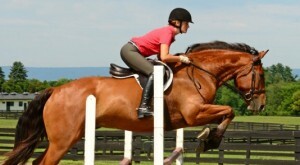 Do you stiffen and grip with your legs in order to sit the trot? Do you have trouble sitting down ‘into’ the saddle? Do you ride with your knees turned out? Understanding where your anatomical hip joints are located will help many of these riding problems melt away. While off your horse take a moment to consider the location of your hip joints. If you were to put your finger on the front of one hip joint where would you point? Obviously you can’t actually touch the joint but where do you think the movement is? Many people think the hips are the tops of the pelvis, where models rest your hands. Other people point more or less to the area where the hip joints located but a bit out to the side. Even this small deviation will adversely influence how you move and ride. When searching for the hip joints you want to feel for the movement in the joints, which is a ball and socket joint. Photo 2. Fold forward at the hip joints. While keeping your finger on the front of the hip joint fold over your finger. Begin to locate one hip joint using your index finger and following along the crease of your pants where your leg joins your torso. Bend your knee and point your foot. Slowly move your knee left and right feeling for movement in the groin area. If you are not sure move your finger a little bit each time you move your leg and feel for the most specific point of rotation. Then lift and lower your foot a little and feel how the hip joint closes and opens. When mounted with your feet in the stirrups locate your hip joints again. Sense the relationship between your seat bones and the hips, which are wider apart than the seat bones but still quite close together. The hip sockets are above the seat bones and towards the front of the pelvis. Identifying one hip joint with your index finger fold forward into a light seat. Feel where the joint movement is. Then lean back from upright position and feel how the hip angle opens. As you ride occasionally locate a hip joint with your hand to clarify where you are moving. Then go back to the old place, where you used to think your hips were and find out what’s different in your riding. Photo 3. Open at the hip joints. Lean back and allow the angle at the front of the hip joints to open. Use this Murdoch Minute to locate your hip joints. Whenever you begin to feel a bit stiff or tense remind yourself of their location so that you let go of excess tension in your seat and legs.